The shelves of our fridge and bar cabinet are positively groaning under the weight of all of the goodies we have to eat and drink over the next two days (if you click on the photo you can see the annotated version in my Flickr stream). Work is already underway on tonight’s meal, and I’ll try to post periodic updates as we go along. To those of you who celebrate, have a safe and happy Christmas. Merry merry to you and your hubby. I so look forward to reading about what you two come up with for the holidays! What’s in the tall glass jug? Tomato juice? Watermelon juice? What’s going to happen to it? I can hardly wait for your updates…. is that a leg of lamb I see in the fridge? 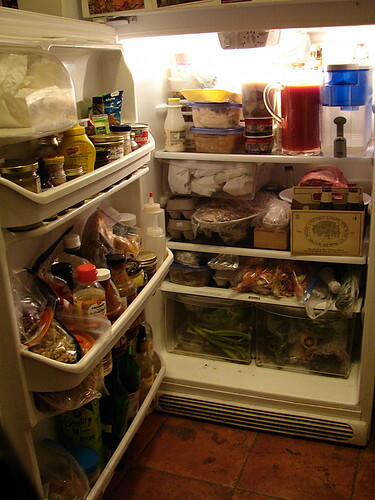 Hard to tell, but I imagine it will show up on your posts soon enough…..
And what a divine fridge that is! I’m positively drooling! Looks like my fridge looked. Hope it’s been emptied by now. I’m ready for the new year and lighter eating myself. I found your website today and have been reading it for an hour instead of studying. This post cracked me up, because its what i like to see in people houses. thanks for the entertainment and great meal ideas.